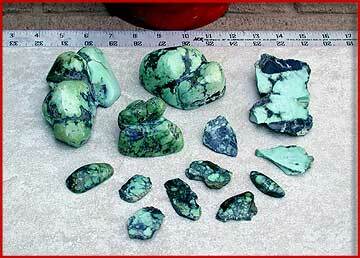 Milkyway Damaile Chalcociderite/Turquoise/Variscite from north-central Nevada. Milkyway Damaile is mint to green and blue/green in color. It runs in a black shale and a goldish brown host rock. There are small to giant nuggets as well as wide vein material that is encrusted by this black and tan host rock. 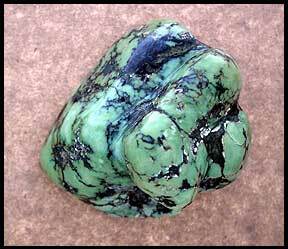 The host rock, being a shale type material, naturally developed veined outsets and pockets of Chalcociderite, Turquoise and Variscite. It is in the host where you will find webbing - veins - swirls and shades of wonderful coloration that often have a milkyway appearance. As you come into the center of the deposit/formation you will find multiple types of water marking that give the clear area of the stone its own characteristic as well. It is a solid 6-7 in hardness and delightful to cut. Sawing the rock is a stone cutters dream as it cuts smooth and does not flake or crumble. Cabbing it is equally a pleasure as you do not need to use a backing material to hold it together - it is solid! In polishing these examples I used a 180 diamond wheel, then I went to a used 400 grit belted wheel, then strait to zam/rouge. I achieved a high polish with very little effort. Dillon took a piece from 180 - 400 - 600 - 1800 - then to zam - it took such a terrific polish and you can actually follow the webbing down into the stone - just beautiful! One of the nice things I like about this rock is how it was mined. There are virtually no fractures! When I received the rock from Shellbone (minor and mine owner) it was heavily laden with host rock, I cobbed it out with a regular minors pick and was, at times having to hit extremely hard to break the host rock off. Still, I found no fractures - that is remarkable! It is very obvious he is not blasting this stone out. Shellbone mines in a traditional style that is seldom scene these days. I commend him for this and highly recommend his expertise if you have valuable material that needs special care getting it out of the ground. Although Milkyway Damaile is from the same area as Tony Cotners famed "Damale" it is not the same rock. Most of what we have seen from Tony has been in small to medium sized nuggets. I find that it does have some of the same characteristics and colors as Tony's Damale. Example Pictures are not necessarily the highest or lowest grade of Milkyway Damaile, rather a good example of a common look from the Milkyway Damaile Mine.